Paradise Living nestled one block from the sea and close to downtown close to the beach and historic Malacon, is an oasis in the city named Hacienda Paraiso; a nine-suite secure property surrounding a tree-filled courtyard including a large heated swimming pool w/ cascading waterfall, outdoor BBQ, bar, dining areas and much more. 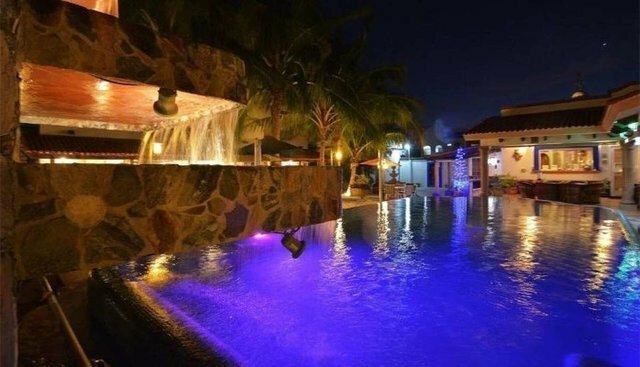 This property has the flexibility to be used as a private residence or commercial resort, as it is currently the #1 Bed & Breakfast (Trip Advisor) in La Paz. The large two bedroom suite is over 2,300 sq. ft w/ gourmet kitchen. The one bedroom casita also has its own kitchen and each of the remaining suites have their own 3/4 bath. The 12 car over-sized garage is perfect for storing boats, RV's and other toys. In a blue and white hacienda-style estate surrounded by natural greenery, this laid-back inn is a 3-minute walk from Playa Posada, 3.2 km from the Teatro La Paz and 4 km from the Catedral de Nuestra Señora de La Paz. Relaxed rooms feature Mexican decor with tiled floors, simple furnishings and a light-hued palette. Amenities include Wi-Fi, satellite TV and refrigerators; 2 have kitchenettes. Complimentary breakfast is served daily. There’s an infinity swimming pool, an exercise room and a garden, plus a parking garage.